Prednisone is a drug that is commonly used to treat inflammatory bowel disease (IBD) and other autoimmune conditions. While prednisone may be effective, it is also a steroid, and that means it comes with a host of side effects. Many prednisone side effects will lessen when the dosage is decreased, but certain adverse effects can be permanent, including glaucoma. High doses or long-term use of prednisone can cause glaucoma, a serious eye disease. Glaucoma may be painless, but it can lead to permanent vision loss or even blindness. This is scary to think about, especially because so many people with IBD have been treated with prednisone, but testing for glaucoma is quick and painless. It does need to be done at least yearly for anyone with IBD, regardless of age, along with a comprehensive eye exam. If the eye doctor is not doing a glaucoma test, be sure to ask for one, even if someone insists that younger age is a reason not to test. People taking prednisone should also tell their physicians if any family members have a history of glaucoma. Glaucoma is the build up of fluid pressure, called intraocular pressure, inside the eye. This increase in pressure could damage the optic nerve. The optic nerve is light-sensitive tissue at the back of the eye composed of nerve fibers that connect the retina to the brain. The optic nerve is essential to vision, as it transmits images to the brain. Glaucoma is diagnosed after damage to the optic nerve occurs. High intraocular pressure may cause vision to worsen and eventually lead to blindness in a few years. Some people may have increased eye pressure, yet no damage to the optic nerve, and may never develop glaucoma. However, high intraocular pressure does indicate an increased risk of developing glaucoma. There are several types of glaucoma, including secondary (complication of another condition or with certain medications such as prednisone), open-angle, angle-closure, congenital (present at birth) and low-tension or normal-tension (associated with normal eye pressure). Open-angle glaucoma. This is the more common form of glaucoma and is sometimes called wide-angle glaucoma. In this form of the disease, the flow of eye fluid through the eye drain (trabecular meshwork) occurs too slowly. The fluid then builds up inside the eye, increasing pressure. Secondary glaucoma. This type of glaucoma is less common than open-angle in the general population, but is more common in people with IBD who are taking prednisone or other corticosteroids. It may also occur as a complication of another condition such as surgery, advanced cataracts, eye tumors, uveitis or diabetes. Secondary glaucoma can be of the open-angle or angle-closure type. Angle-closure glaucoma. In this type of glaucoma, part of the iris blocks fluid from leaving the eye through the trabecular meshwork. Fluid builds up suddenly, causing an abrupt increase in eye pressure, severe pain and nausea, blurred vision and eye redness. If not treated promptly, blindness can occur in a few days. In many cases, glaucoma may be present without any symptoms. By the time such symptoms as the loss of peripheral or side vision occurs, the disease has already progressed considerably. 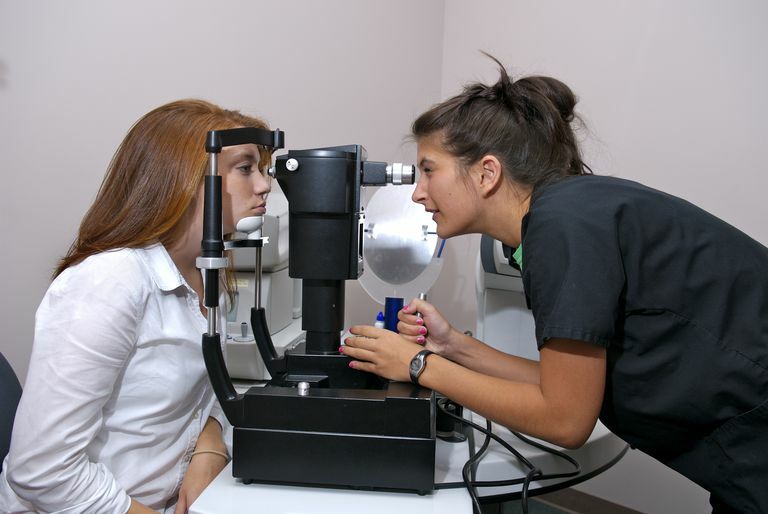 An eye exam every one to two years may help in detecting glaucoma early. Those taking corticosteroids should talk to their healthcare provider about how often to get an eye exam. Glaucoma is diagnosed through two simple and painless tests. The first test is dilation. The doctor puts drops in the eyes that dilate the pupils. When the pupils are large, the doctor can use a light to see to the retina at the back of the eye and look for signs of glaucoma or other disorders. When the eyes are dilated, vision is blurry. Some eye doctors may use newer techniques, such as retinal imaging, which takes a high-resolution picture of the eye without the need for dilation. The second test is tonometry. During an initial tonometry test (pneumotonometry), a machine "flattens" the cornea with a small puff of air against the eye. If this test shows any abnormalities another type of tonometry test may be performed. Eye drops are used to reduce the volume of fluid in the eye or increase its flow out of the eye. These drops must be used several times a day and side effects include headaches, stinging, burning and redness. Laser surgery may be used to remove the blockage or increase fluid outflow from the eye. In trabeculoplasty, the trabecular meshwork is pulled open; in iridotomy, outflow is increased by making a hole in the iris; and in cyclophotocoagulation, the eye is treated to reduce fluid production. Side effects from laser surgery can include inflammation. The procedure may need to be repeated. In microsurgery, an opening is created in the eye to help excess fluid drain. This treatment is often used only after other treatments are not successful. Side effects can include inflammation, cataract and cornea problems. With new treatments for IBD, corticosteroids are not being used in the same way as they were in the past. These medications are now used less often and for shorter periods of time, lessening the chance that there will be serious side effects. For patients who do receive corticosteroids for IBD or for another condition, it is important to understand the potential for serious side effects and to monitor for them carefully. Huscher D, Thiele K, Gromnica-Ihle E, et al. "Dose-related patterns of glucocorticoid-induced side effects." Ann Rheum Dis 2009 Jul;68: 1119-1124. 25 Jan 2016. National Eye Institute. "Facts About Glaucoma." National Institutes of Health 2011. 25 Jan 2016. Rutgeerts PJ. "Review article: the limitations of corticosteroid therapy in Crohn's disease." Aliment Pharmacol Ther 2001 Oct;15:1515-1525. 25 Jan 2016.